To boldly go where no man has gone before! Well, actually no. Six men, chosen from thousands of very highly qualified applicants, will tomorrow climb inside a "spaceship" in Moscow and embark on a mission to .... Moscow. Strangely, the trip will take 520 days. 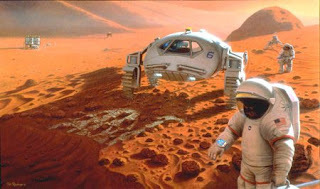 The six men are involved in a European Space Agency (ESA) mock round trip to Mars. The experiment, called Mars 500, is designed to explore how humans cope with the stress, confinement and severely limited company that will confront future astronauts on missions to the farthest reaches of the solar system. The ESA will simulate equipment failures and medical emergencies in order to keep the men, three Russians, two Europeans and one Chinese, on their toes throughout the "mission". The men will also simulate a mock Mars landing 250 days into the trip. I hope they will be safe? Good luck gentlemen, on your mission to nowhere.